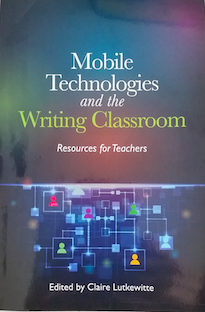 The theories and lesson plans included in Mobile Technologies and the Writing Classroom draw on the idea that mobile technologies mediate a more intimate and personal learning experience. As handheld devices, mobile users’ physical connection to mobile technologies can lead to a sense of ownership. When utilized in the writing classroom, this ownership can extend to learning that occurs through the mobile device. Composition instructors interested in developing or including lessons using mobile technologies should explore the lessons included in this edited collection. Lesson plans in this collection can be adapted to various pedagogies and technological affordances at most institutions. While all the lesson plans develop from theory, the strength of this collection comes from the lesson plans, student examples, and discussion of possible changes and adaptations. Using my handheld mobile phone, I captured the book cover image to demonstrate the intimate and personal. I chose to use my own created image because taking a photo on my mobile device is easy, familiar. More importantly, this photo also provided a moment for critical engagement with mobile technologies. Due to the lighting in my office, my reflection is captured in the image. This photo makes the book review feel more personal than a publicly available image of the book cover. I created and staged the image to literally reflect my person holding my mobile device. Additionally, throughout this webtext I included tweets I created on my mobile device as I read the book and wrote various drafts of this review. I wanted elements of this review to utilize mobile technologies in meaningful ways to further the conversation from the book, to further connect the review to the personal. These tweets offer a glimpse into my composing practices as I read and wrote, connecting to the call for students to explore their composing practices through their mobile devices. I started using the hashtag #mobiletechwriting so I could easily find my notes for this book review. As I read and re-read through them, I saw patterns in my thinking and a clear difference between reading notes and writing notes. The notes used and unused continue to live in their original form on Twitter and here in this review. They serve as an example of the ways readers and writers can engage with academic composing practices through mobile devices.